Erin Bradley Designs: New Design & Retirement Sale! New Design & Retirement Sale! TGIF! Happy Friday, everybody! As you may see, EBD has a new design which I am so excited about! I was just wanting something a little more fresh. Hopefully this one will stick around for a little while (as I do like to change things up!). I'm also having a retirement sale. You can find the retiring designs here. Although I will probably still offer some of these designs at Ink Obsession Designs, I'm removing them to make a little more space on the website for new designs. 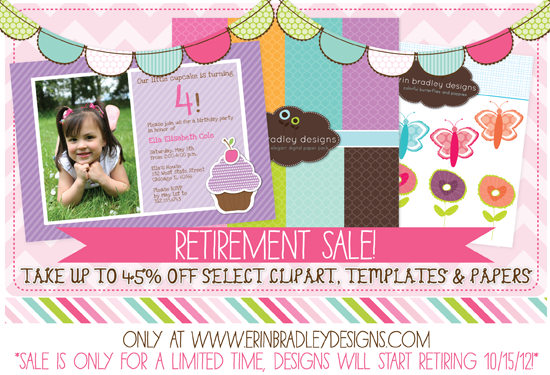 The retirement sale starts now and you can take up to 45% off select clipart & digital papers sets and photoshop templates. It is only good at www.erinbradleydesigns.com. The sale will continue until all of the designs have been retired (so if you have your eye on something get it quick! I'm going to start retiring sets on Monday, 10/15/12).